In the November 2018 Snapshot Survey, we asked contractors all about choosing equipment brands. Here's one survey question and its results from the summary report, which is now available in its entirety to EGIA members. Question: Do you carry multiple equipment brands? While there are some intangibles and soft skills that are inarguably central to your business’s success – trustworthiness, expertise, overall customer experience – a customer’s need for working equipment is what makes the phone ring, so the actual equipment your company offers is still vital. 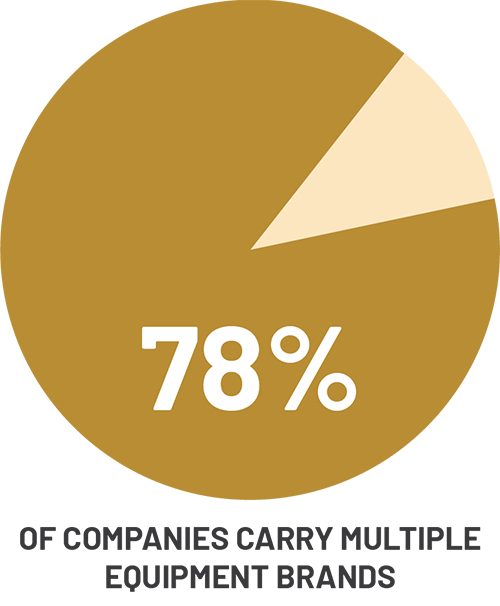 According to our respondents, nearly 4 out of 5 companies – 78% – offer multiple brands of equipment, while 22% exclusively carry a single brand. There are various schools of thought to either side of the question – vetting out the perfect manufacturer for your customer and committing to them, for example, versus offering a wide range of products to ensure you have the right equipment for absolutely everyone. The important thing is considering those various factors and how they fit into your overall company philosophy, goals, customer profile and more, as well as finding a distributor that you trust and work well with. Login to access the full research report on local events and home shows. For a deep dive into service management operations, pricing, and other equipment-related concepts, and to access training materials, recommendations and education pieces, visit the Contracting Best Practices Library at the EGIA Member Dashboard.